Jennifer Winget was born on 30 May 1985 in Goregaon, Mumbai. She did her education at St. Xavier’s High School and KJ Soumya College, Mumbai. She holds Bachelor’s degree in Commerce. She made her acting debut as a child artist in 1995 film Akele Hum Akele Tum co-starring Aamir Khan and Manisha Koirala. Her debut in adult role was in 2000 through Raja Ko Rani Se Pyar Ho Gaya co-starring Arvind Swamy and Manisha Koirala. Apart from films she also appeared in Television shows, her TV debut was through Shaka Laka Boom Boom in 2000. She gained popularity after appearing in serials like Saraswatichandra, Dill Mill Gayye, Kasautii Zindagii Kay etc. She won Indian Telly Awards Jury best actress award for her performance in Saraswatichandra in 2014. She also hosted several shows like Nachle Ve with Saroj Khan, Comedy Ka Maha Muqabala, Zara Nach Ke Dikha 2, Laughter Ke Phatke etc. She participated in reality shows like Comedy Circus 3, Zor Ka Jhatka: Total Wipeout etc as a participant. She was born to Marathi Christian father and Punjabi mother. She has an elder brother. 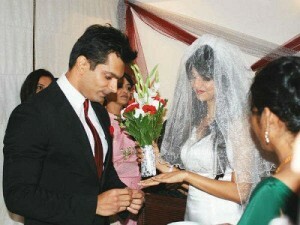 Jennifer Winget and Karan Singh Grover dated for years before marrying on 9th April 2012 in a simple private ceremony. The couple first met while working for Kasautii Zindagi Kay in 2005. Karan Singh Grover is also her co-star from Television show Dill Mill Gayye aired from 2009-10. The couple broke up in November 2014 due to irreconcilable differences.